Kitesurfing downwinder Aspendale to Hampton, struggling for wind! Session 365. We jumped at the chance of a downwinder in the afternoon wind. Stu and I drove to Hampton and left my car, then we drove to Aspendale and met Stu S and Mike. The wind seemed a touch light on the beach but I thought it would be better further out. We got going without delay and soon realised that a direct tack to Ricketts Point was the go. The Union 10 was flying well but I was certainly not overpowered. Just past Ricketts the wind dropped a few knots so our pace dropped off. Then it dropped to around 12 knots. I could only just keep going, even repeatedly looping the kite. Downwinders are not much fun when there is not enough wind! I headed in towards the main Sandringham beach near the yacht club and the wind felt stronger so I tacked back then struggled a bit to get around the breakwater. Just past the breakwater the wind picked up to provide a fast finish. Mike and Stu W were close behind me, but Stu S had dropped his kite off Black Rock so I jumped in my car to get him. Just as I arrived he was getting a lift in past the Cerberus on a jetski! He had dropped his kite in the light wind, relaunched it but dropped it again then performed a self rescue. All is well that ends well. Session 364. Once again the sea breeze later in the day was stronger than forecast. Dan, Mike and I had a sweet session at Brighton. I decided to use my Nugget rather than the foil board due to limited time. There were a few folks out with the foil boards, including Natalie Clarke. The Union 10 handled the lightish wind (15 knots) well but there wasn't enough wind for many jumps or tricks. I snuck close to some of the foil boarders to get some photos. Dan and Mike took out the Union 10 for a quick test run at the end of the session, they both liked it. Now I am hanging out for 30+ knots so I can have ago with the Union 8! Session 363. I got down to Mentone late on Friday after work. One guy was landed a big 17m kite. There was around 10 knots wind so I decided to have a go. I could just get going on the Flite 14.5 and did a couple of runs toward the Beaumaris Motor Yacht Squadron and back. I stopped and flew my kite on the beach. A curious dog came up to me and barked. I did one more run then packed up. It was great to see the sun set and soak up the ambiance, Mentone is a nice part of the bay. Session 362. I picked up two new kites - Airush Union 10m and 8m - from Ivan at the The Zu Boardsports, and traded in my Lithium 12 and 9. There was some good wind at St Kilda, I used the Union 10. I pumped at The Zu with the handy compressor. I reset the bridle to the "low bar pressure" attachments on the leading edge, and the rear line attachments to the "medium bar pressure" (middle) attachment point on the wingtips. The new analogue bar is much lighter. I setup and launched then headed out past the learners. There was a good swell coming past the breakewater. I rode it into the beach then continued along towards Albert Park. 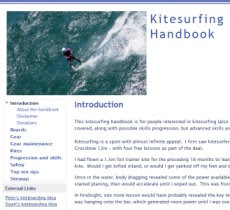 The kite is very easy to control and parks well when riding waves. I toured across near to the Spirit of Tasmania then headed back. The leading edge is much thinner than the Lithium 12 which helps the kite go upwind really well. I then did some runs to the breakwater and back out, surfing the big swell in. I did some jumps and got a real shock when the kite kept flying up! It boosts much better than the Lithiums did and heads for the moon! I didn't have any trouble landing them but the extra airtime takes some getting used to. I tried one back roll and over rotated then crashed - the extra boost in the kite provides more airtime and therefore more rotation so I will go easier next time. The kite has more pull on downloop turns compared to the Lithium too. I rate the Union 10 out of 10 - it does everything well and I couldn't find a fault. It think it was definitely worth upgrading, particularly before my other kites (over 3 years old) lose too much value. A word of caution for beginners though - test fly a Union before buying one. They turn and fly fast and could be a bit too responsive while learning. If you are starting out an Lithium may be a better kite for your first year or two. Session 361. I headed down to Hampton to catch the late sea breeze. Heavy traffic now so it took a while to get there. I considering using the foil board but there wasn't much time, so I used my Lithium 12 and trusty Nugget. I resolved to work on my erratic back rolls. Given I often loop the kite I concentrated on keeping my hands together. This worked. I completed a roll in good control, but the kite ended up flying the other way, so I am still pulling on the back hand a bit. I did about 6 on the left tack, landing one back roll kiteloop which feels really good when it works. On the right tack I couldn't even get one to work. About 4 other kiters were out and one windsurfer. The breeze dropped right off when I finished. Next time I will try some back rolls with my front hand pulling down and also try an agressive back roll kiteloop with the rear hand pulling down. A nice way to finish the week. Session 360. Another great downwinder! Aspendale to Mentone is a really good run with some great bay waves along the way. Grant even did it on his windsurfer! Stu and Job were well ahead by the time I started so I kept catching waves following the beach along. It was a warm day and the 15 knot wind was not deterring swimmers - there were a lot out most of the way along. I did some nice jumps for variety using waves as kickers. I had a go at kiting back and got up close to the pier when the wind dropped so I headed back to Mentone direct. This downwind run was quite different as I had to keep my board speed and kite speed up to generate maximum power. I caught the others just before they drove off then waited for Grant to take me back to my car. Great fun was had by all, in my case for 21 km! So good!